The current reform of the Common Agricultural Policy (CAP) has set new rules regarding the eligibility of agroforestry parcels for CAP first pillar support. The application of the new Basic Payment Scheme is creating concern for agroforesters, as some of the rules and regulations regarding the presence of trees, shrubs or hedges in agricultural land are becoming more restrictive. Maximum tree density in agricultural parcels: the 50 tree/ha recommendation is no longer of application, and a new regulation establishes a compulsory maximum of 100 trees/ha for arable land. For permanent pastures, Member States can use the same tree density limit, or apply an alternative “pro-rata system”, where there is no specific limit for tree density. However, the pro-rata system applies progressive “reduction coefficients” that diminish the eligibility of parcels containing trees or other landscape features. Trees or other features protected by the Cross Compliance do not restrict eligibility in any way: e.g., such trees will not count towards the 100 tree/ha limit or the pro-rata reductions. In silvopastoral systems, trees or shrubs that can be grazed should not restrict eligibility either. Nevertheless, these guidelines produced by the European Commission could limit very much the application of this exception to trees. 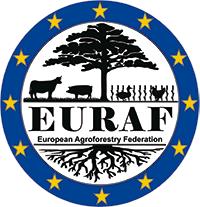 EURAF has already contested the content of the guidelines in this regard. Choose their own tree density limit (always below the 100 tree/ha maximum). Apply the pro-rata system to permanent pastures, instead of the tree density limit. Create exceptions through Cross Compliance rules. In Spain, the Ministry has protected by GAEC7: i) hedges and boundaries up to 10 m wide, ii) groups of trees with a surface area below 3000 m2, iii) patches of natural vegetation below 1000 m2. In France, the Minister of Agriculture announced on 1st December 2014, that hedges will be protected by GAEC7. A similar protection will be offered for silvopastoral systems of pigs grazing in oak or chestnut forests (see last slides in this presentation). This approach is generating in-depth debates among French associations. The Omnibus regulation launched at the end of 2017 has helped to improve the eligibility of agroforestry within the current CAP as the new concept of permanent grassland is more in line with agroforestry implementation: “Land which can be grazed, where grasses and other herbaceous forage are not predominant or are absent, and where the grazing practices are neither traditional in character nor important for the conservation of biotopes and habitats, may nevertheless have relevant grazing value in certain areas. Member States should be allowed to consider those areas as permanent grassland in the whole or in part of their territory”. Moreover, the option of having established local practices was implemented in most of the southern countries like Spain (13 out of 17 Spanish regions adopted it) to allow farmers to delivery animal products based on the available resources such as shrubs. The relevance of the shrubs is huge as they are one of the ecological traits, besides the self-seeded species, able to provide feed for livestock during the summer droughts in the South of Europe, when no herbaceous vegetation is available at all.